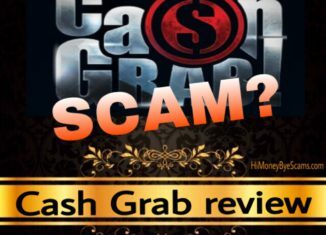 Cash Grab Review - SCAM by Jamie Lewis? NO ONE TOLD YOU this! 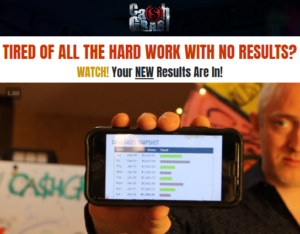 Home > Online opportunities > Cash Grab Review – SCAM by Jamie Lewis? NO ONE TOLD YOU this! Are you wondering if cashgrab.com by Jamie Lewis is a scam? Or is this your ticket to financial freedom? As you may already know, there are so many scams out there, so doing your due diligence is the way to avoid frauds and find the honest way to build a passive income business. When it comes to Cash Grab, there are important details that you need to know before making a final decision, so let’s see the truth about this program. 1 What is Cash Grab about? 2 Does Cash Grab really work? 2.1 Can you start making money by spending only $37? 3 Is Cash Grab a scam? I recently received an email concerning this Cash Grab system, which is Jamie Lewis’ latest product. I decided to check it out to see if this one would be worth it or just another scam to stay away from. Honestly, I didn’t think it would be a scam because it’s been created by Jamie Lewis, who is an experienced marketer, but I still took the time to do my homework before coming to a final conclusion. The sales page for Cash Grab is very similar to sales pages for other Jamie Lewis’ products, such as Profit 365, Wealthy Agency and Bank Ramp. I actually had fun while watching the sales video, it’s a little bit different than other sales videos that I have watched. 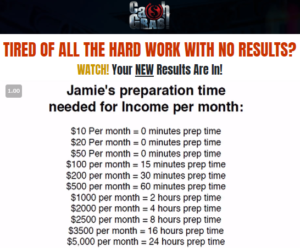 According to Jamie, it’s time for you to finally start making money online without having to work hard. He acts as if this program was better than the others. What I don’t like is the fact that he launches a new product every few weeks because it seems like the other products he has launched are not getting improved. I mean, wouldn’t it be better for existing customers to get new training or improvements for the products they have bought? I don’t know about you, but I personally appreciate products and programs that get updated. Jamie claims that you just have to copy what he has designed and test it to see the same results he’s been getting. Sounds cool? In my opinion, it sounds too good to be true because copying what someone else has done is not hard to do. However, I’ve heard the same thing in other sales videos and it’s never true. You can’t just copy someone else and expect to get the same results because there are lots of factors to take into account. In this case, it’s possible to make the kind of money that Jamie talks about, but it’s not easy or fast. Note that he has lots of years of experience so he knows his stuff and he definitely is not going to tell you everything he knows for just $37. Another thing he says is that there are no digital products or MLM involved in the methods he teaches, but I have my doubts. I mean, why does he say that there are no digital products involved but some of the income proofs he shows are from the digital products that he sells as a vendor? In my opinion, Jamie doesn’t make money using all the methods that he teaches in these products because most of the income proofs he shows come from making money as a vendor or affiliate. Yes, the other methods still work but they are not methods that you can use to make money quickly or easily. There’s no way to earn thousands of dollars fast when you are getting started. Does Cash Grab really work? Cash Grab doesn’t work in a way that you can make money within a short period of time. Yes, it’s possible to make money with the business models that Jamie mentions in the training, such as affiliate marketing, domain flipping, freelancing… but there are no methods that you can use to start earning money right away. All businesses and methods take work and time, and not all them are for everyone. If you are getting started, it’s not advisable that you get involved in different business models at the same time. Inside the Cash Grab members area you will also find a calculator that is supposed to tell you what method is best for you based on your skills and the amount of money you want to generate. This “calculator” also shows you how much preparation time you need to make x amount. For example, earning $500 per month allegedly takes only 1 hour of preparation and making $5,000 per month takes 1 day of preparation. Honestly, I couldn’t help but laugh when I heard it because it sounds very unrealistic, especially for beginners or people who don’t have much experience. These numbers are probably accurate for a marketer like Jamie, who knows his stuff and has lots of years of experience. But this is not accurate for newbies, so I don’t like the fact that Jamie acts as if making money online was that easy for people who still have no marketing skills. There are some videos for each method, but you can be sure that you will need to learn from other sources because the training is not in-depth, not to mention that you can probably find some of this information for free in other websites. So, depending on the method that you decide to focus on (it’s best not to focus on various methods at the same time), you will need to search for other high-quality training to learn from because Cash Grab doesn’t contain all the information that’s necessary to make the kind of money that Jamie talks about. Can you start making money by spending only $37? Like other ClickBank and JVZoo products, Cash Grab has some upsells that you will see if you pay for the initial $37. Well, if you try to exit the page, you can get access to the Cash Grab members area for $27. Once you have made the initial payment, you will get bombarded with some one click upsells that cost hundreds of dollars. Beware of one-click upsells because it means that if you click on the “buy” button once, they already charge you. These upsells might include more training about the business models mentioned in the front-end product, but I don’t believe they are worth it. I mean, why would you spend more money without knowing if the front-end product works for you? I believe it’s best to first learn from the training included in the front-end product, and once you have decided what kind of business you want to build, you can decide whether or not you need to invest in more training. I believe it’s important that you take it into consideration before making a purchasing decision because you don’t want to spend money on something that you don’t need. This is something that product creators don’t tell you because their goal is to profit as much as possible. And the same goes for affiliates who try to make money from products that they haven’t tried. They are not transparent about the real cost, which I believe it’s important for potential customers to know. Something that I want to point out is that there’s no information about the way your data is going to get used or the “rules”. I personally don’t like to get involved with websites that are not transparent about the way that they use information like email addresses because many of the websites that don’t provide this information tend to be scams or websites whose owners take advantage of this information to profit. I mean, they collect as many email addresses as possible and sell them to other marketers. I’m not saying that this is the case with Cash Grab, this is just something I have realized after having reviewed hundreds of websites. I don’t consider Cash Grab to be a scam, but I know that not everyone will have the same opinion as me. Even though the sales presentation is a little bit misleading, I don’t consider it to be a scam because it’s sold on ClickBank, which is an indication that you can get your money back if you purchase it but end up not satisfied. People who hope that they can make money fast will probably call Cash Grab a scam because it’s not the solution to quick money. It’s definitely possible to make money while you sleep as Jamie claims, but it takes a lot of effort and time to make it happen. That’s why I don’t like products whose owners make false promises instead of giving realistic expectations. What you end up doing is up to you, but after everything I’ve seen, I have to conclude that I do not recommend Cash Grab. If you asked me what business model I recommend for beginners, I would say affiliate marketing because it’s simple to understand and doesn’t require a big investment. As an affiliate marketer, you earn commissions when you get other people to buy products/services through your affiliate links. It’s a business model that gives you the chance to talk & write about a topic you are passionate about and earn money. How cool is that? There are many people who are using this business model to earn a full-time income online, so if others can do it, who says you can’t? If you believe you can and take action, you will make it! Oh, and did I mention that you get the chance to start today for free!? In my guide I let you know my favorite Internet marketing platform where you can find step-by-step lessons and tools that will help you start the proper way. And that’s not all! I also reveal how you can receive my personal guidance and how you can get help from thousands of affliate marketers who want to see you succeed! I hope this Cash Grab review has been helpful to you and you will make the best possible decision.